It seems August 17 could be the day we see an official announcement regarding the first Nokia Windows Phone. 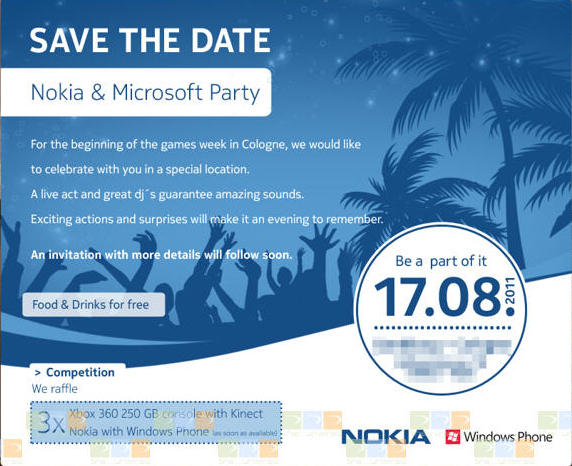 Microsoft and Nokia are handing out invites to an event being held in Cologne on the said date, which does not go into the specifics of the event (apart from the fact that there will be a live act and a great DJ) although we do have reasons to believe Nokia will be announcing their new handset, particularly one running Windows Phone 7 Mango. There will also be a raffle at the event, where the winners can get three of the Xbox 360 250GB consoles with Kinect and more importantly (for us, at least), three of the upcoming Nokia Windows Phone handsets as soon as they are available. This makes us even more confident in our assumption that there will in fact be a new Nokia Windows Phone announced that night. They say they will make it an evening to remember. We shall see. Some info from the party? ex me, it is 17 & there is no news yet why?! !